You can’t get too far in a discussion about the nation’s electric power sector without running into the question of costs. How do renewable sources, such as solar and wind, stack up against fossil fuels, such as coal and natural gas? How much will it cost utilities and ratepayers to build—and operate—a new power plant? 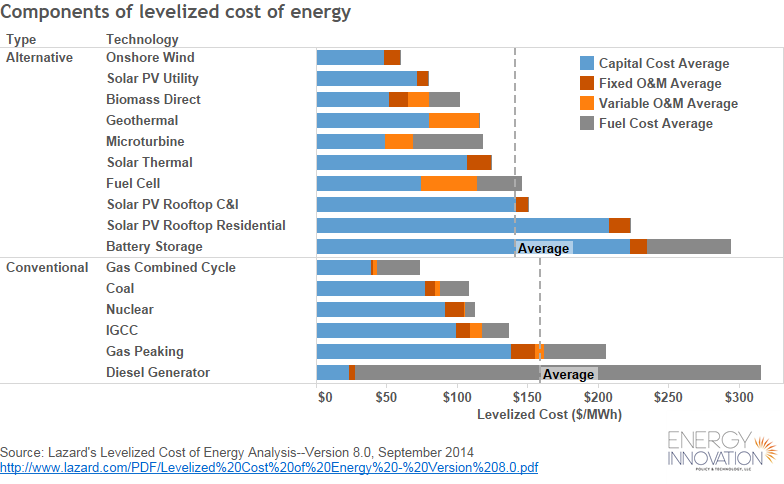 The U.S. Energy Information Administration’s Annual Energy Outlook 2014 provides a different set of levelized cost figures for a variety of technologies. 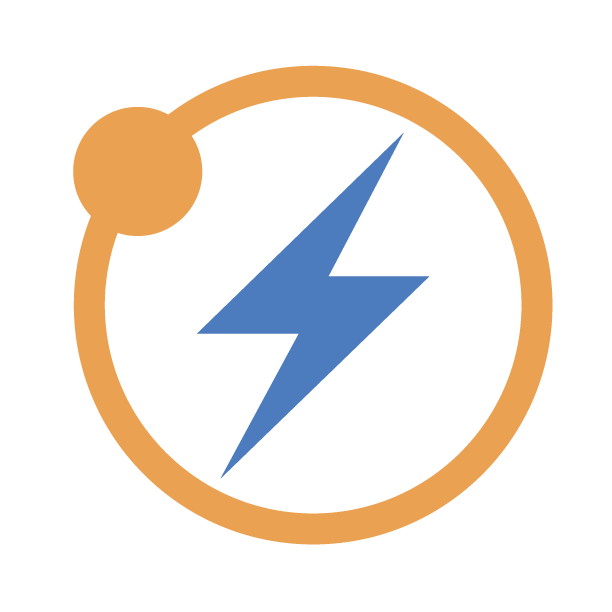 This post was originally published on Energy Innovation’s blog page. There is more than LCOE and external costs: integration costs.The integration costs will rise in the future, specially for solar in area’s far from the equator. It is great to see the levelized cost broken into components. That makes it easier to make a realistic comparison. For example, generally coal plants can be replaced one-for-one with nuclear plants, so their levelized costs can be compared directly. But to replace coal plants with solar and wind, some combination of battereries and natural gas backup would be required. So add the fixed costs of the gas/batteries to the levelized cost of the solar/wind and compare that to the levelized cost of coal. Notice that gas peaking plants have a much higher levelized fixed cost than gas combined cycles even though peaker plants cost slightly less to build; that’s just the effect of operating at lower capacity factor (e.g. with high wind/solar penetration). Incidentally, you can make the solar, wind, and nuclear options look better compared to fossil fuels by choosing a low interest rate (see the Lazard report p.12, Sensativity to Cost of Capital). Note that utilities can always borrow money cheaper than homeowners and private developers. Garbage in, garbage out goes the saying. The methodology of looking at comparative costs or renewable energy is like comparing a half truth with a whole truth. What are the full costs of renewable energy? And moreover, which is cheaper at displacing C02, renewables or conventional energy? Renewable energy can’t compete with conventional energy as to the net cost of displacing C02 because it is intermittent. So the above “study” only compares the cost or renewable energy for, say, 6 hours per day for solar power and triumphally claims it is cheaper than conventional power sources. But what is the full 24-hour cost of renewable power? Europe has found that the cost of natural gas unsurprisingly doubles when replaced by renewables. So add the doubled cost of Nat Gas power for, say, 16 hours per day with the cost of renewable power for 6 to 8 hours per day and you would get closer to the real cost. 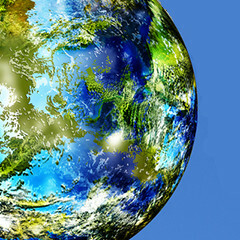 The US is probably the best country in the world for the deployment of wind/solar energy due to the combination of a number of factors: 1) excellent wind/solar resources (wind and solar capacity factors are literally double the global average), 2) lots of space 3) stringent coal regulations greatly inflating capital costs, 4) abundant natural gas for balancing wind/solar and 5) good subsidy support. However, the figures presented in this article (Lazard) are over-optimistic, using low-end capital costs and high-end capacity factors. 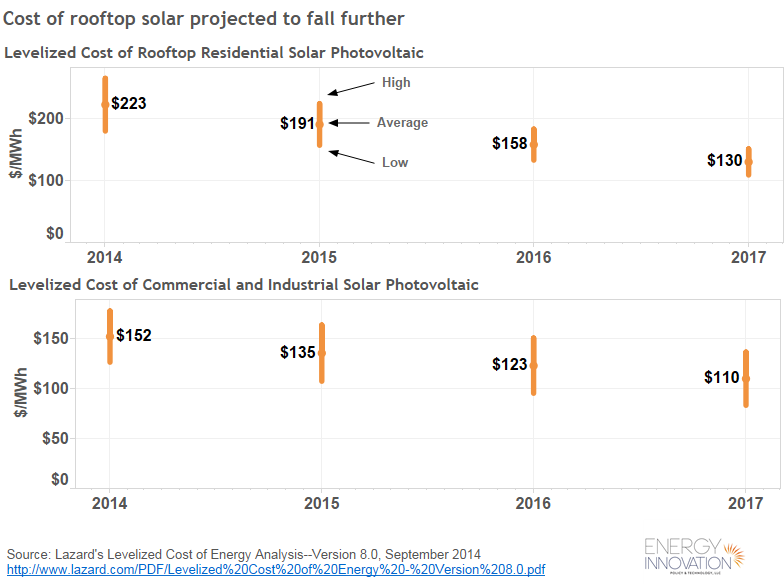 As shown below, real world numbers for wind and solar costs result in LCOE numbers which are 32% and 64% higher than Lazard’s estimates respectively. 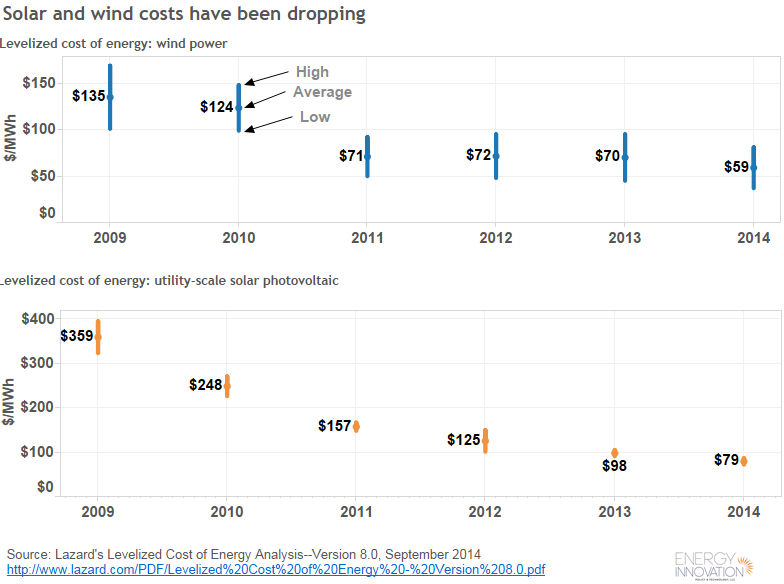 Let’s compare Lazard’s 2012 analysis to real world data for wind and solar. For PV it is important to distinguish between AC and DC capacity factors and costs, something which Lazard seems to have missed. 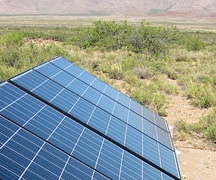 This is where knowledge of statistical frequency analysis comes in handy, since it is straightforward that as the renewable energy portfolio is expanded in terms of (1) the distribution of wind turbines across a windpower supply region, (2) transmission connecting grids with independent windpower supply, (3) the distribution of solar power across a solar supply region, (4) transmission connecting grids across different time zones and with independence of reductions of solar incidence and (5) combining wind and solar on the same grid, the share of the RE energy portfolio that is intermittent declines, and the share that is not intermittent increases. So the premise “intermittence rules out deriving a large share of our energy supply from the harvest of variable RE” requires the tacit appendix, “so long as we try to harvest that supply from a too narrow area and too limited a range of different variable RE sources of energy, and refuse to include any substantial share of dispatchable RE in the portfolio”. And with the appendix, instead of being “why RE cannot be used”, it becomes a description of how not to use RE. The experience in France is that relying on a very heavy share of nuclear also requires a substantial back-up capacity of dispatchable fueled energy sources … and of course France is not an island, and the heavy French use of nuclear is also supported by cross-haul transmission with the rest of Europe. The numbers in the article are grossly underestimated, as you show, and would be even more so, if the below factors were accounted for. The Northeast has an overall capacity factor of 0.25. Ridgeline wind costs about $2,600,000/MW + grid connection costs. – The 63 MW ridgeline wind system in Vermont took $20 million to properly connect to the grid, plus about 1.5 years of lesser production to minimize grid disturbances. – The 60 MW Seneca project was cancelled because $86 million of grid upgrades were required. Another cost is adjusting the generator population to have the mix of capacities to adequately balance the variable energy. That new mix of capacities likely would not be as optimum as without variable RE. Another cost is the lesser efficiency of the generators that are doing and/or are impacted by the balancing. Another cost is having nearly ALL conventional generators available, in good working order, staffed and fueled, when there is no or minimal wind and sun, which can occur during any time of the year. Yes, zero-carbon grids built with either nuclear or variable renewables would both involve use of long distance transmission, dispatchable backup power, and perhaps energy storage; the difference is that the nuclear-rich portfolio would need about an order of magnitude less. The reason is that nuclear plants fail independently (e.g. a grid with 100 nuclear plants would never have more than a few percent of them fail during peak demand times), whereas all wind farms in a large region can fail simultaneously due to weather systems, and of course all solar plants fail simultaneously every night. Can you support that statement with some back up? Texas has seen incredible growth in its wind generation installed capacity. According to ERCOT, wind ICAP was 1173 MW in 2003 and grew to 11,065 MW by the end of 2013. Completion of the $7 billion Competitive Renewable Energy Zone will eventually bring 18,500 MW of wind capapcity from the West Texas wind farms to the state’s population centers. To examine a levelized cost of energy there must be some accounting for the transmission construction costs necessary to realize the benefit of the generation. Also, it is interesting to note that as West Texas winds are noted for blowing contrary to when demand is peaking, the development of projects in coastal areas has increased dramatically. Coastal winds are more reliable and are typically strongest when system demand peaks. In fact, based on multi-year averages, ERCOT has assigned a summer peak average capacity for coastal wind of 56% compared to only 12% for non-coastal wind. As others have already stated more eloquently, if you are going to compare costs, you need be certain 1) you have included all assignable costs, and 2) the capacity is actually available when it is needed. If you cannot use two sources of generation interchangably, any cost comparisons are somewhat lacking in relevance. If I understand your comment correctly, you are saying that the statement “RE is intermittent” must be qualified because if there were a gigantic RE system across time zones in the U.S. then intermittency would be reduced. But if that was the case, then so would costly redundancy. Marc Jacobson of Stanford University’s Precourt Energy Institute has concocted a plan whereby RE would supply 100% of all energy needs. But it would require an energy system, by my guess, at least four times the existing system in order to provide any reliability. I worked for a large regional water agency in California for 20 years. I learned that water and energy systems have to have redundancy built in especially in the event of a catastrophic loss of part of the grid or many power plants simultaneously. What I am talking about is the redundancy needed to make RE reliable 24/7/365 as does, say, nuclear power. I am saying that the statement “RE is intermittent” has to be qualified by looking at real world output duration curves and coveriances among different sources and between different portfolios and demand. Fertig (2012 ~ this is a poster, as the article is now behind a paywall) find that interconnection of the BPA, ERCOT, MISO and CAISO would double the amount of firm power (available 92% of the time) compared to the the best case of the four (MISO). On the order of 15% of nameplate capacity would be firm power, so with a capacity factor in the range of 30%-35%, over 40% of power generated from wind by that system would be firm power. As can be seen in the output duration curve from Fertig (2012), BPA wind on its own is essentially all intermittent, but since it is effectively independent in the covariance of supply with MISO, interconnecting MISO and BPA would still reduce the intermittence of MISO windpower. That is windpower alone, but HVDC transmission is agnostic to the source of the electrons, and that can just as easily be used to shave the top off of peak solar generating periods in Central Texas two hours before Southern California solar peaks and from Southern California two hours after Central Texas peaks. As Fertig (2012) notes, at present (subsidized) costs for NG electricity generation, that firming is financially cheaper to provide with NG. However, on a full economic cost analysis including the full cost of the NG emissions the transmission would be economically competitive. The redundancy needed to make firm RE as reliable as nuclear power is similar to the redundancy needed to make nuclear power as reliable as nuclear power. Since nuclear power is not, in fact, 24/7/365, in either case, substantial dispatchable capacity is required to compensate for either the predictable (predicted changed in windspeed, planned reactor downtimes for fuel changes) or unpredictable component of supply variability. The nuclear requires a smaller total energy supply and fast dispatch for a larger share of dispatchable back up power, since large unpredicted supply outages are not common, but tend to be rapid when they occur, while windpower / solarpower / run-river-hydro / etc. requires larger total energy supply but a smaller share requires fast dispatch, since on the order of half of variability of RE supply can be predicted a day or more in advance. 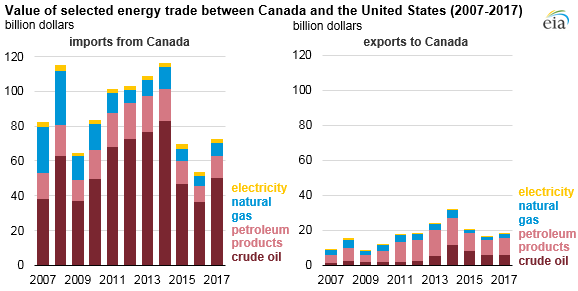 [caption id="" align="aligncenter" width="578"] Source: U.S. Energy Information Administration, based on U.S. Census Bureau [/caption] Canada is the largest energy trading partner of the United States, based on the combined value of energy..